Increase The Body's Capacity To Adapt To Stressful Conditions! Rhodiola (Rhodiola rosea) is indigenous to the Arctic and Alpine regions of Europe, Asia and America and has long been used as a tonic by many cultures, including the Ancient Greeks. Rhodiola is generally known as an "adaptogen", a term which refers to any agent possessing the ability to increase the body's capacity to adapt to stressful conditions. The adaptogenic effects of Rhodiola have been demonstrated in numerous studies, resulting in increased resistance to the effects of stress, and improvements in associated anxiety and moodiness. This standardized extract of min. 3% Total Rosavins and min. 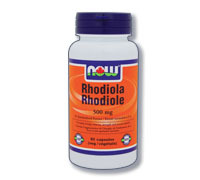 1% Salidrosides is the highest potency of Rhodiola available. Suggested Use: As a dietary supplement, take 1 VcapÂ® 1 to 2 times daily, preferably with meals.